If you've been out in the job market seeking employment, whether you are moving from an existing job or just starting out, you know how tough it can be. Hiring managers complain they can't find enough people to fill jobs, but what they are really saying is they can't find people with the needed skills to fill the position. Or at least, they think they can't. What you have to do is set yourself apart from the crowd and call attention to your skills and qualifications. And you don't have very long to do it. Careerbuilder's annual Resume Mistakes Survey, conducted by the Harris Poll, found that 43% of human resources (HR) managers, the gatekeepers to most jobs, spend less than one minute looking at a resume. About 24% said they spend less than 30 seconds before deciding which pile it goes in. That puts enormous pressure on a jobseeker when he or she produces a resume. Making a strong, positive first impression is key to moving to the second phase, meeting with a hiring manager. When the survey-takers asked the HR people to provide examples of the wrong approach to getting noticed, they had plenty to offer. These resumes probably got passed around the office, but for the wrong reasons. How about a proof reader? Some gaffs might have been avoided by just having someone proofread the document. In one case, the applicant’s name was auto-corrected from “Flin” to “Flintstone.” Making matters worse, his first name was Freddie. HR officers say embellishment is also a big problem. Seventy-seven percent said they have spotted a lie on a resume, such as the applicant who listed work at a federal prison as part of his employment history. It turned out he had been an inmate. Other applicants reveal too much about themselves that shows they really aren't a serious, business-like person. Such as the applicant who said he had been a prince in a previous life or the applicant who used direct quotes from Star Wars throughout his resume. Those are some of the things not to do. So what did the HR officials say they want to see on a resume? 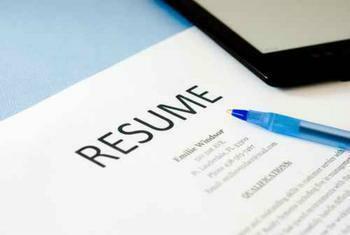 The biggest thing your can do to help your case is customize the resume for the job. For example, let's say you are applying for a job in sales and your experience is divided between sales and management. Tweak your resume to emphasize your sales experience and make sure it is reflected in your goals. In other words, let the HR official know what you can do in that specific job. Also, HR managers say they want to see skills listed first on a resume and they expect a cover letter. If it is addressed to the HR person personally, it will win added points.